I have a special place in my heart for real time strategy games. Some of my fondest memories are playing with my dad in our cobbled-together home LAN with games like Age of Empires and Red Alert. But until last week, the last time I had seen a quality mobile RTS was Warfare Incorporated back on my Palm Tungsten T3, almost a decade ago. But now there's a real alternative: Desert Stormfront, from Noble Master Games, is worth a look from any dedicated strategy fan. It emulates the look and feel of Command & Conquer (with a few important changes) but wraps it all up in what's probably the best touch interface for an RTS available at the moment. The story for the single player campaign is simple: Iran is getting uppity, which prompts the US to invade and start wrecking stuff. Iran calls help from Iraq and Syria, the US brings Britain, France and Germany into the party, and so on, and so on. It's not really important - for most strategy games, the single player mode is just a warm-up for full-scale battles and multiplayer. After playing through the tutorial, you're greeted with thirty story missions from the Allied perspective, none of which last more than ten or twenty minutes. Difficulty ramps up quickly, and with a decent curve. Aside from the single player campaign, you can enter a skirmish (single player, customized battle against up to 7 computers) or go for local LAN or Internet multiplayer. Unfortunately I was unable to find any online games, and my dog is more into Jetpack Joyride, so I can only talk about my experiences in single player. But what's there is rich and varied enough for some serious fun, if not a whole lot of replay value. Mechanics are simple: you start out with a "factory" building for creating Humvees, tanks, rocket launchers and the like, plus a set amount of cash. You don't create your own buildings, you have to capture them: a Humvee can capture or repair an oilfield, air field, or shipyard, at the cost of the unit. 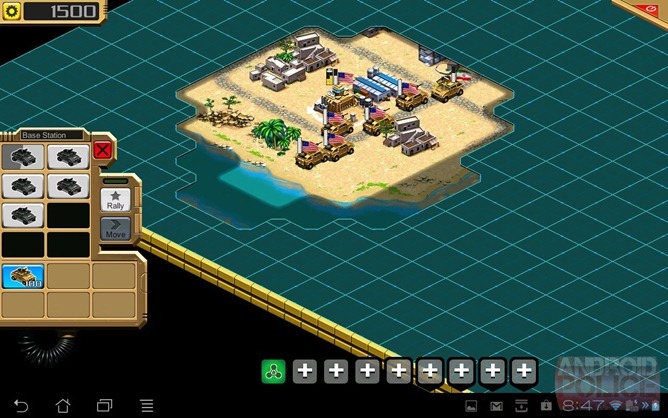 Oilfields get you more cash (for creating more units) and air and sea units can be created at their various points. Buildings can't be destroyed - damage a building enough and it reverts to a neutral state, easy to capture. Without the ability to build structures on your own, you're left to the mercy of the map for base location, resource gathering and defense. The "fog of war" is standard, but can be turned off in skirmish or multiplayer modes. Units are relatively balanced in capability, firepower and range. Load up on Humvees and you'll get slaughtered by tanks. Build a bunch of tanks and you'll get sniped with missile launchers. It means that loading up on any single unit, either in the air, on the ground or at sea, and you'll be beaten by a skilled human or computer opponent. You always want a good mix of units with plenty of spare Humvees in the wings for expanding, though they all seem to move at the same snail's pace - more on that later. 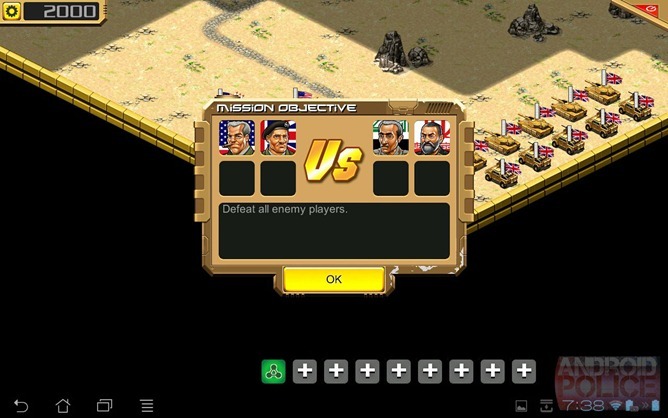 Previous attempts to bring a Command & Conquer-style game to Android had me longing for my old Celeron machine and its gloriously precise mouse. 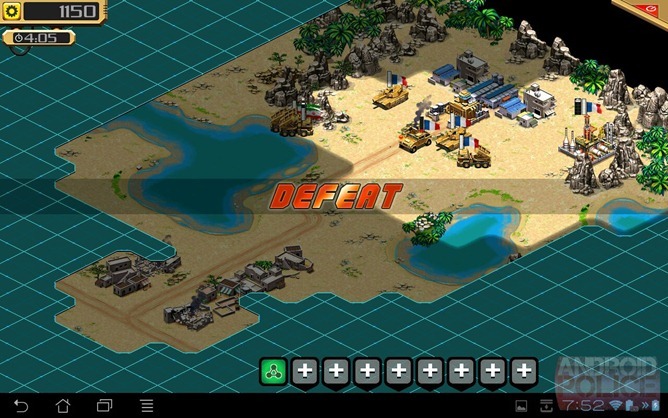 Desert Stormfront doesn't emulate the mouse and keyboard interface that birthed the genre, but instead makes an impressive attempt to remake the controls for tablets (smartphone play is possible, but not recommended). First of all, every menu is dynamic, only appearing when you need it: tap on a building to see its unit options, or tap on a single unit or group to see theirs. Even the mini-map is collapsible, giving you as much viewing area as possible. But the real innovation in Desert Stormfront's interface is the group system. It's nigh impossible to play a desktop strategy game well without using group hotkeys: Control-1 to assign a group of Archons in Starcraft, for example. Before now, such an action was basically impossible on mobile, but Noble Master has found an elegant solution. Tap the green icon at the bottom toolbar to start your multi-select tool, then drag it across a group of units. You can then command them to take an action, or assign them to one of eight unit groups. Groups can be restructured at any time. 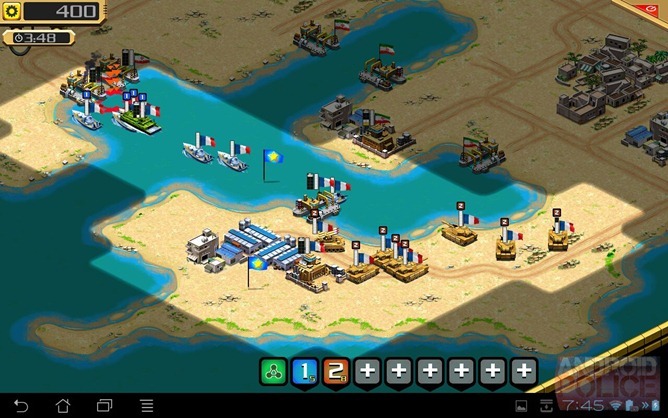 This, more than anything else, allows for precise and flexible control of your army as it moves across the map. 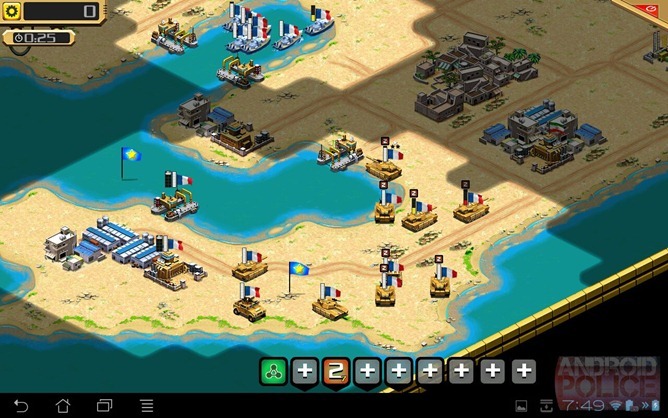 The number of units is displayed in the corner, and even the different types of units create color-coded icons. The unit grouping is an impressive addition to the interface and might be worth a look all by itself from those who enjoy strategy titles on the PC. Now, it's not all sunshine and mushroom clouds. 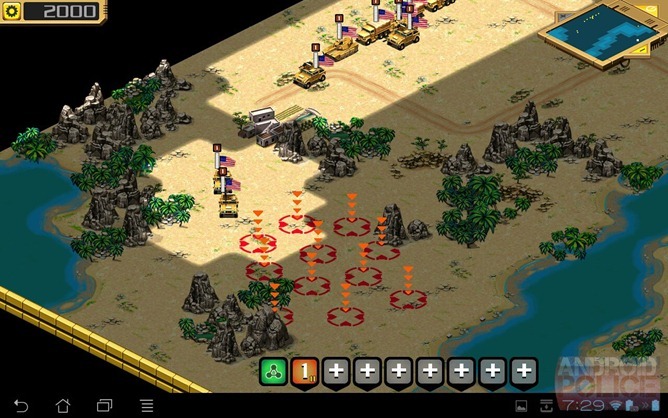 The interface and the focus on capturing rather than building structures makes Desert Stormfront as mobile-friendly as it could possibly be, but the developers seem to have added another dimension. 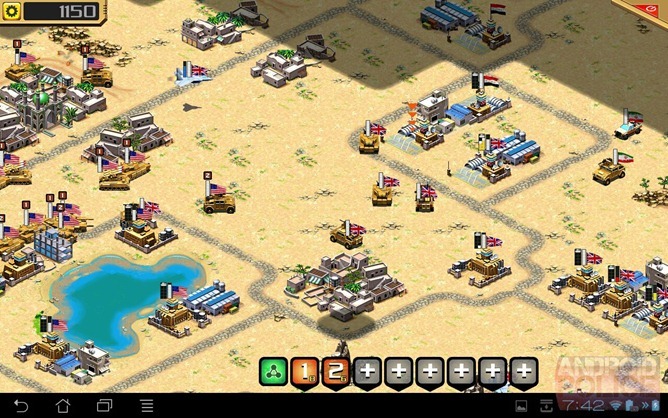 Time in this game is slowed to a crawl: units move along the desert as if they're stuck in molasses. Even the air units are so slow that it will take a Chinook helicopter five minutes to get across the largest maps. The achingly slow pace of combat, and the inability to speed it up, is the one sour spot in the whole game. Players used to 100+ action-per-minute PC games will feel like they're moving in slow motion. 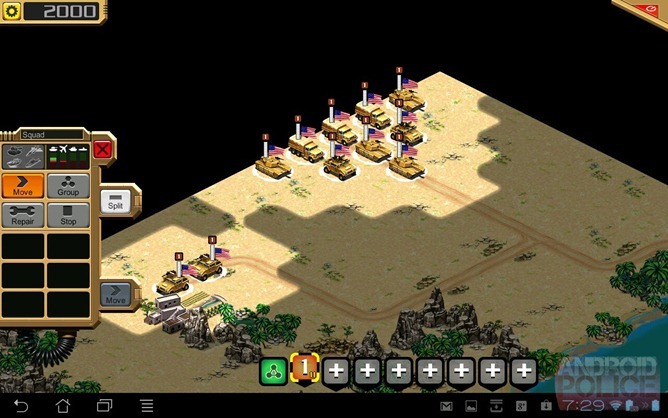 The presentation in Desert Stormfront is solid: attractive if somewhat derivative 2D sprites, themed menus that are direct and uncomplicated, and units that are distinct enough to tell apart easily. One thing that's frustrating about the armies themselves is that allegiance is marked with a flag above every single unit and structure, which makes them harder to differentiate than the standard palette swaps. The maps are also a little repetitive - you'll get "Middle Eastern desert plus some water" on just about every one of them. But the music, good Lord, the music! It might be synthetic, but the background music is downright fantastic. There's mention made of this fact on the game's market page, but you really need to experience it for yourself. Epic pseudo-military tracks fit the mood and tension just right. This is the first Android game for which I've felt the need to put on headphones while alone in my home. Beyond that, it's pretty straightforward. It runs well on my Transformer Prime, with no crashes during my review, and even manages to stay in memory without using up system resources. If only the online matchmaking was a little more streamlined (and populated). And as nice as the interface is, it's nearly impossible to use on a screen smaller than seven inches. If you're on the fence, try the free demo. Desert Stormfront is far from perfect. It shares faults with some of Tim Burton's movies: achingly slow, at times a little bland, and in need of some more color. 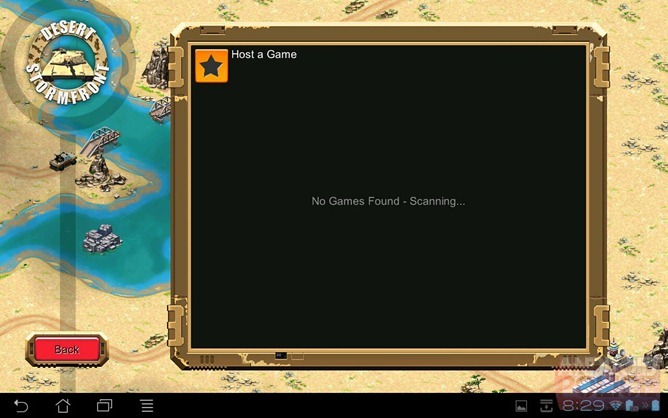 But dig deeper and you'll find one of the first strategy games built from the ground up with a touch interface in mind. The dynamic menus and unit grouping are nothing short of brilliant, and I would encourage developer Noble Master to continue the fine work on display here in future titles. There's plenty here to warrant investigation from strategy gamers even in a flawed title. Beyond the interface you'll find a unique take on building structure and some surprisingly great music, with a multiplayer experience that should be a ton of fun... if you can find seven other tablet owners and get together on the same LAN. 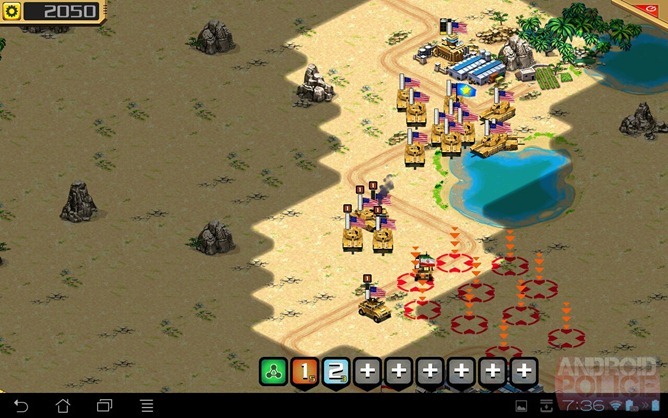 Desert Stormfront is $4.99, and blessedly free of ads or in-app purchases. If you'd like to check it out for yourself before pulling the trigger, there's also a demo version available, as well as the slightly older but quite similar Tropical Stormfront.